So you guys saw the tuner I got at the hamfest this weekend right? 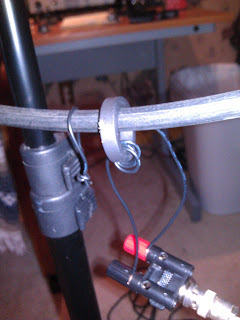 Well I knew right away what I wanted to do with it: build an L network tuner, and a magnetic loop antenna. 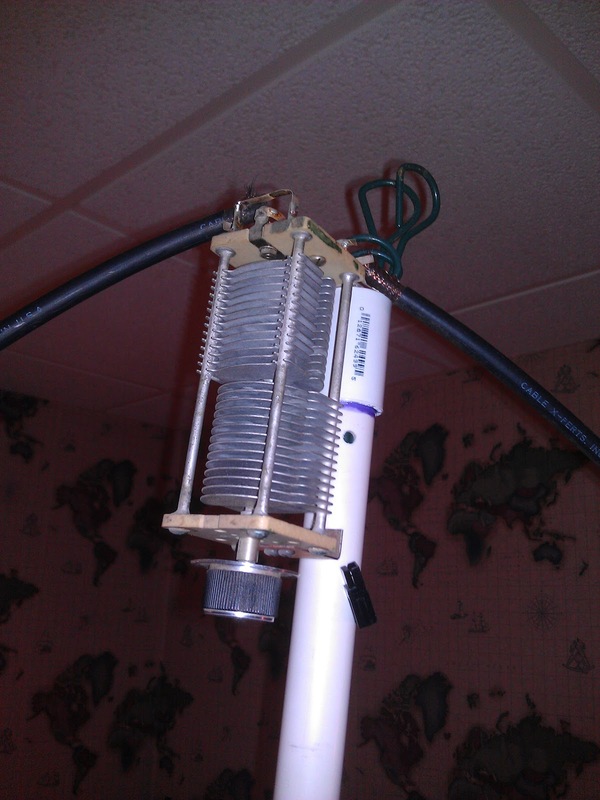 Today, I started working on the antenna. Whole thing - notice, I'm in the basement! I fired up the K1 and sure enough, I could tune for maximum receive noise, and as expected, the tune peak is very sharp but not terribly hard to identify. I hit the tune button with the ATU in bypass mode, and voila, a 1.5:1 SWR on 20m on the first shot! I tuned around the band a bit and actually could hear signals. Now, mind you, this was all done in my basement shack, close to the outer walls so I was quite impressed to hear anything! I turned the antenna around to see how good the nulling worked and was surprised that it did indeed null out some noise in one particular direction. Cool! Holy cow!!! I got spotted on the Reverse Beacon Network! How cool is that?! 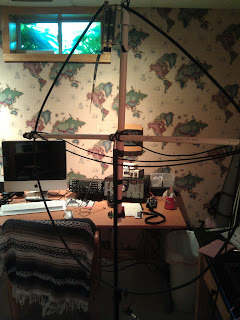 Clearly, some more work to be done with the setup but at first glance, this is going to be a good back yard antenna. Unfortunately it is a little too heavy to be pack worthy. Next step: mount the capacitor to something and add some connectors to the coax so I can pack it all up. Then build a better support structure. I wasn't able to get a good tune on 15 meters for some reason, so I'll have to keep tweaking the turns on the toroid and stuff. Need to try it out on some other bands too! I'll keep you updated!